Do you see a pattern in my recent reporting? Less time is passing between updates. We're into the finishing work now. Here's the progress this past week. The team has pulled off the job for a few days and so has the rain. We use this time to finish the exterior painting. 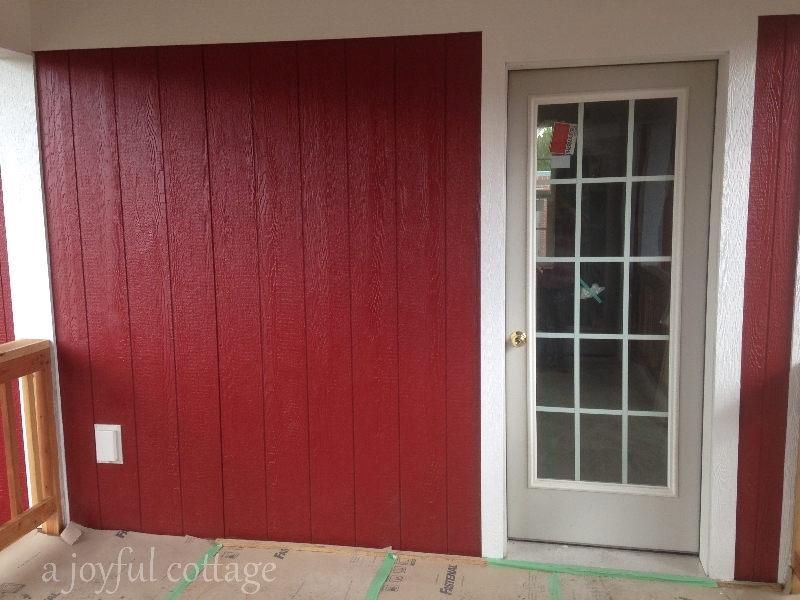 Dennis applies a second coat of red paint and I work on the lower panels of the porches. I also paint some of the trim. Such as the wood on the garden window brackets. And the vertical porch trim and the door trim. One afternoon I took a tumble off the porch and landed on my bum, which was a good thing because that's where all my padding is. I'm very thankful to God that I received no injuries except for a small bruise on my left wrist. I'm not exactly sure what happened, but I think I may have gotten tangled up with the drop cloth. I was stepping down from a ladder and the next thing I knew I was falling onto the concrete. A bit scary, but I'm fine and no paint was spilled. I paint more porch trim while Dennis works on landscape sculpting and gravel walkways. Dennis has a vision for our cottage landscaping that I enjoy seeing come to fruition. Here he's working on the front entry terrace. The guys are back. 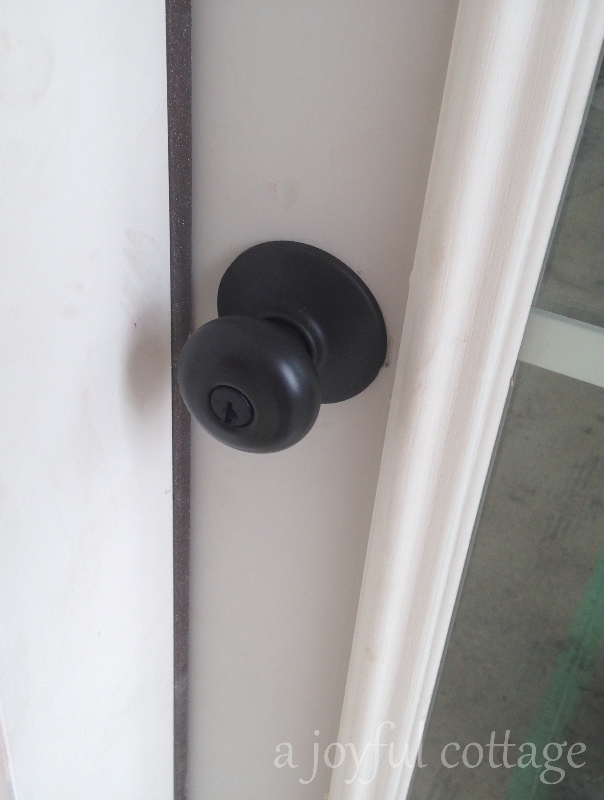 Exterior door hardware is installed. Dennis does more work on the terrace. 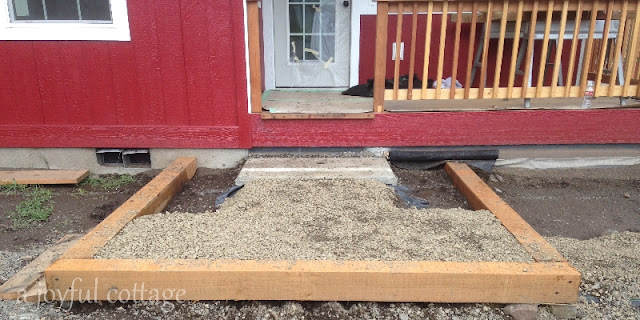 Soon the porch step and hand rails will be installed, and top soil will fill the recessed areas where the dirt is. Then I can plant some pretty flowers. 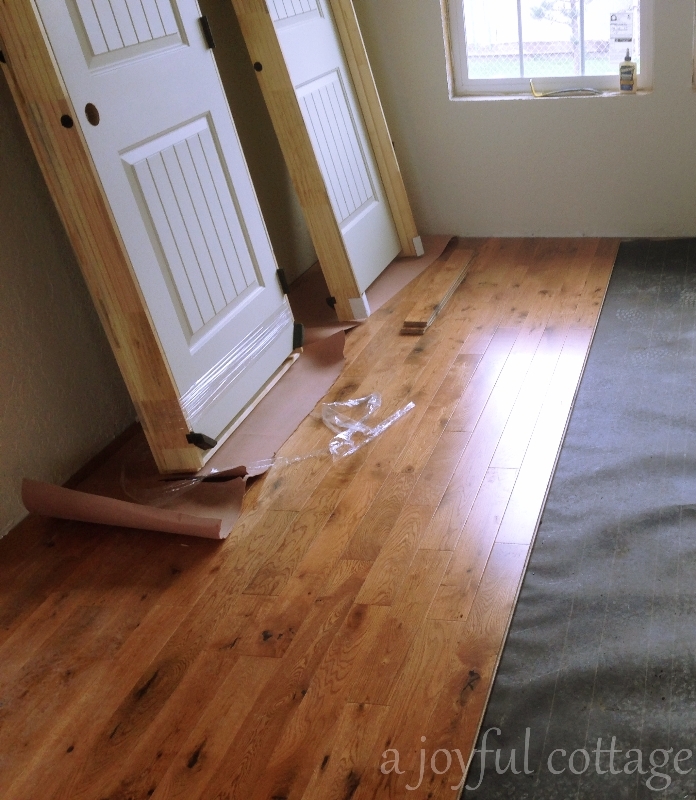 The hardwood flooring is nearly complete. The team should finish the hardwood flooring today and then Dennis will start installing floor tile in the hallway and bathroom. He'll do all the interior trim, too. The kitchen cabinets are due to be finished this week. Thanks for all your nice comments and encouragement. We're getting close! 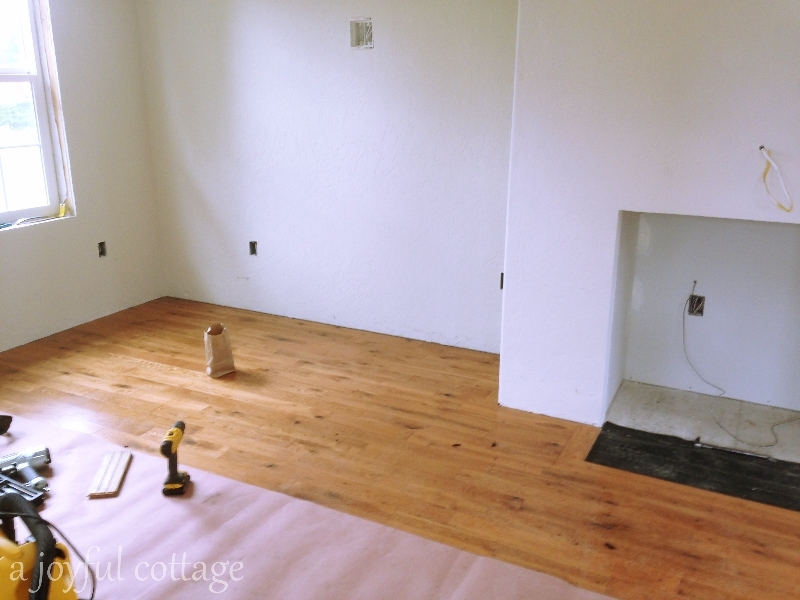 I feel so privileged as a blogger to watch the progress of your adorable cottage home. I feel a connection to all you have accomplished in building, an excitement for you and Dennis as the final stages are coming together. 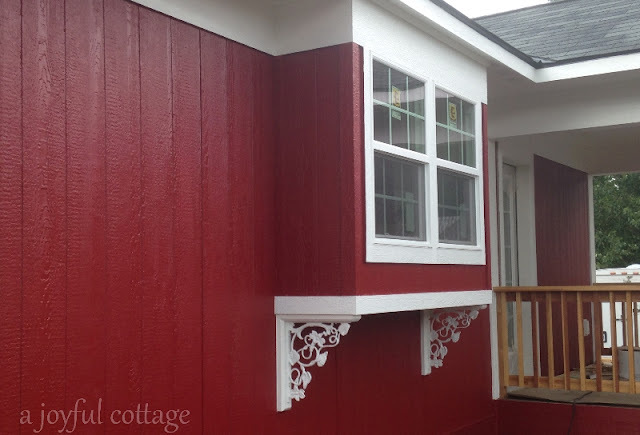 I love the happy Red paint, from the first rendering to actual painting the exterior. It puts a smile on my face. For it is a cheery fun color choice. Sorry about you fall... Gotta admit I'm a klutz and have taken many spills. It's really coming together. I love the red. So sorry about your tumble. I hate falling. But it is a good feeling that you didn't break something when you do fall. It gets more exciting every time you share the progress on your sweet new home! Your floor is gorgeous and I LOVE the garden window. I'm so glad you weren't hurt when you fell. No paint was spilled? My friend, that would be the least of my worries! Just beautiful Nancy. I love the hard wood floors they are so pretty. 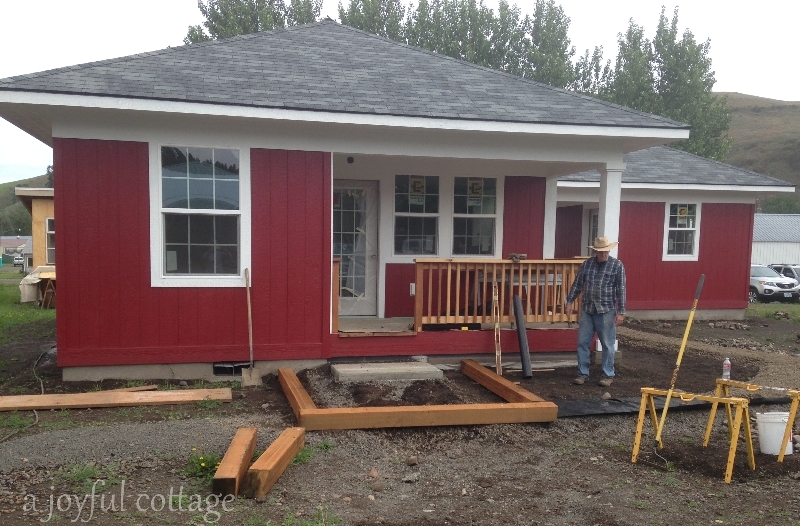 You guys are getting so close to having your new cottage home complete. This has been so fun to come along with you. Everything is looking great. Love the stain on the floors! So pretty! 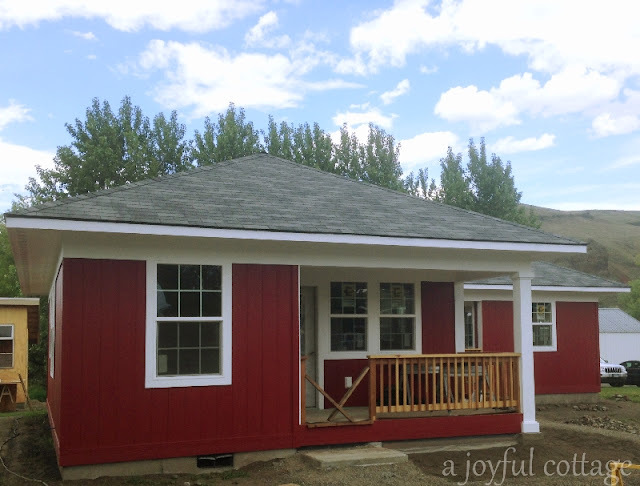 Will the wood on the porch rails be white ? It's beginning to look like a home :-) Love the color. You really are getting close. I like the landscape design and the pathways . 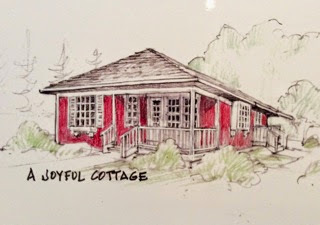 . .
You each have such a vision for your cottage and its surroundings. Happy you weren't injured in your fall . . .
Be safe in these "winding down" days . . . I'm amazed at each progress update how much progress you are making! 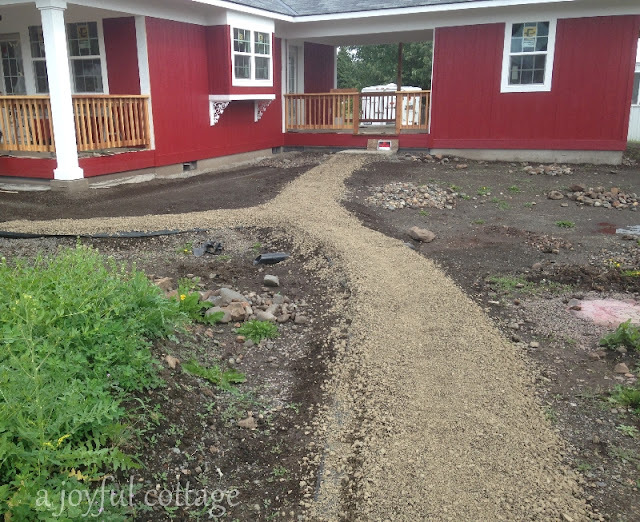 I just love the outdoor landscaping that Dennis is doing, and can't wait to see the landscaped yard with flowers... know you will have fun with that! Your painting escapade sounded kind of scary, but I'm so thankful you were okay! Appreciate this round of the progress report, and am certainly enjoying the journey with you from afar - oh the blessings of blogging :) Much love to you today! I can't wait to see the final product! It's looking so great!! Glad you weren't hurt in your fall! Looking good, I bet you can't wait to get in! Love the window brackets! Just love the contrast with the red and bright white, very cheerful. But may I be so bold and ask what your red paint is, just love it, but perhaps it is a custom blend! Oh Nancy, your homestead is ON THE MOVE! Soon you will be ready and for the holidays you will be sharing a lovely Norwegian style Christmas, maybe? OH DO! Thank you for your visit and dear words. I want to glow. I want to shine HIM. That red is so rich with a second coat. Just gorgeous. Pretty floors too! To build your own home is something truly special, you must be so excited with the progression now. Glad to hear that your fall wasn't too bad as I'm sure you're itching to get it all done. That path is lovely! It's really coming together and looks so nice! I tell you, this is just beautiful. I always share your posts with my husband. We are dreaming too. Your cottage looks more amazing by each post!